We were really looking forward to a long weekend away. 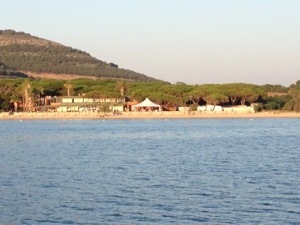 The forecast was looking good at 36 degrees with light winds – perfect for some R&R in a local bay. 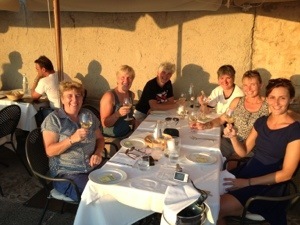 The six of us arrived in Alghero at 10am after an early start from Luton. We stopped at our favourite cafe for a focaccia and a beer before going to the boat. Liz went with Donna and Liz C to do the food shop whilst Ben, Aly and I got the boat ready. Most had a little snooze for an hour or so before going into town where we all went for local rock lobster with spaghetti, washed down with the local white vermentino. Very nice. Today, after a leisurely breakfast, there was no wind so we motored to Porto Conte – the large bay about 8nm from Alghero just before the main headland of Capo Caccia. We arrived around 2pm and anchored in a bay by the local marina. The first time we anchored it didn’t set properly as it seemed we had found a thin layer of sand over rock. We were okay whilst we had lunch but didn’t want to risk it overnight so we moved to another area of the bay and reset it. We are about to have a BBQ but needed to wait until it had cooled down a bit as it was still 31 degrees at 7.30pm! 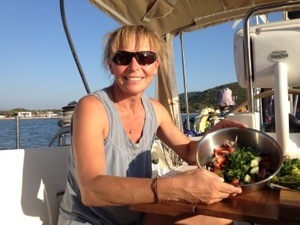 Pictures below of our meal on the ramparts, Liz C helping with supper and the beach at Porto Conte. We are in England and cant wait to get back to Spain!! !